This large size brass-cast, some selective parts – sanghati, the large sheet worn over the shoulder and down to feet known by such name in the Buddhist tradition, and the lotus seat in special, anodized in deep purple for giving cooper effect, rest glistening with gold’s lustre, represents Lord Buddha, the great liberator of the mankind. He has been represented as seated in ‘padmasana’, a cross-legged posture with his lotus-like crimson tender feet turned upwards giving the sitting posture ‘padmasana’ name. The seat he is sitting on consists of a full blown lotus with a plain top and circular base. Its distinctly conceived petals radiate like gold while deep copper like spaces in between afford them brilliant contrasts. The artistically spread bottom of the ‘sanghati’ looks like a velvet cushion with gold border laid over it. The artist has so manipulated the image that the golden border of the sanghati seems to appear as emerging from his golden feet. 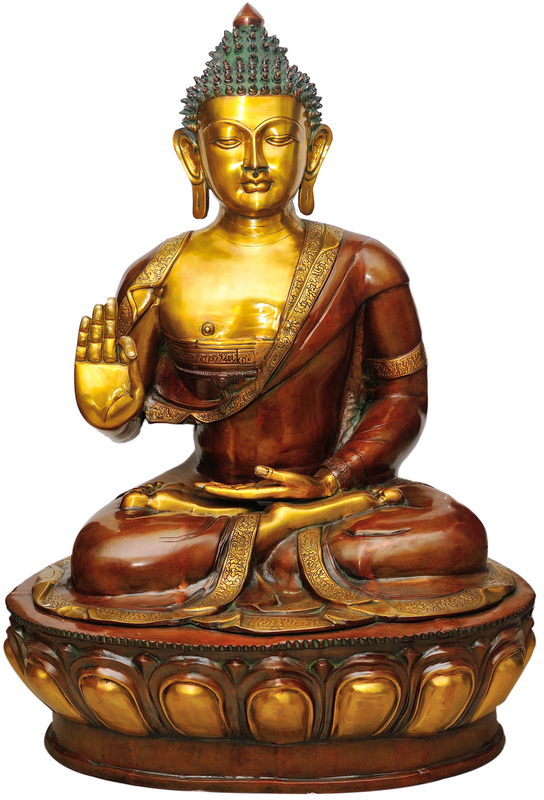 The statue represents three of the most celebrated aspects of the Buddha’s image : Buddha as engaged in meditation, Buddha in ‘vitarka-mudra’, that is, elaborating an issue – some cosmic mystery or the like, and the Buddha, granting ‘abhay’ – liberation. Different from Hindu or Christian traditions where ‘abhay’ is granted against demonic powers and evil or as an assurance of protection from them, in Buddhist tradition it has altogether different connotation. In the Buddhist tradition ‘abhay’ is granted against the enemy within, and it is not by his (Buddha’s) mercy, or by the mercy of some divine power, it is rather by knowing oneself, one’s enemy within, that he is liberated from this arch enemy. The Buddha taught that one’s fear – fear of death, disease and distress, is his enemy, and once one is able to free oneself from their fear then there is no death, no disease, no distress for him. Buddha taught that death is not anyone’s problem; his problem is the fear of death and one has to overcome it. 'Abhay', freedom from fear, the essence of Buddha's teachings, is also the essential theme of this statue. It was what the Buddha had realized after his years long rigorous penance and search within. This fear occupied one’s entire being and needed to be hunted out, which one could not do unless he entered into himself, searched his fear, this arch enemy, defeated it, and worked his redemption, something that he was required to himself accomplish. The path of one’s liberation was through one’s meditation of which the Buddha presented the ultimate model. He did not grant freedom from such fear, he only led the mind to it. Hence a posture imparting ‘abhay’ – fearlessness, has in the Buddha's iconography a widely different connotation. In iconographic model of ‘abhay’ imparting images in other sects the deities are differently modeled. While imparting 'abhay' with one hand they invariably carry in other, or others, different weapons meant for their devotees’ protection; in the Buddha's ‘abhay’ icons the other hand is conceived as engaged in meditation for it is by meditation that one shall find the path to liberation. Abounding in rare magnificence the statue is unparalleled in its quality, elegance, stylistic versatility, spiritual fervour and divine aura. As ‘abhay’ – liberation from fear, is the outcome of right understanding, ‘vitarka’ – interpretation or contemplation leading to self-search through meditation is its essence. Hence, usually a Buddha image in ‘abhay’ mudra also synthesizes ‘vitarka’ and meditation. In the Buddha’s case the first two aspects relate to his pre-Enlightenment and post-Enlightenment phases, and the third, stretches over both for it was in search of redemption from fear – death, disease and distress, that the Buddha renounced the world; and, it was for leading others to the path of liberation that he re-entered into the world. Obviously, his aggregation, this statue is one of his most accomplished forms of his image. The composure of his face, beauty of his left hand with its upwards turned palm, largely shut eyes, and sublimity enshrining his entire being are the attributes of ‘dhyana’ – meditation. Largely a round face with a beautifully turned angular chin, normally shaped cheeks, broad forehead, large ears with longer earlobes, well trimmed eyebrows and far more beautifully conceived eyelids, besides a stout figure with highly balanced anatomy, the image of the great master seems to have been modeled after the best of Tibetan icons of the medieval era.